Every day you put furniture through a rigorous routine. The Brick provides you with comprehensive coverage for defects in the construction of your furniture resulting when used under normal, daily use. With this Plan, your furniture is protected and will provide you with the comfort in knowing that we will repair your furniture in the event you require service. The extended Furniture protection also extends coverage to wood furniture components. Please refer to your Furniture Warranty certificate by your invoice purchase date to understand your extended warranty coverage. Go ahead and live your life to the fullest. Whether you have little ones or like to entertain, investing in this Plan makes perfect sense. The Brick provides you with single-incident* coverage for accidental stains from water, food, beverages, and cosmetics. Contact us as soon as the accident occurs, and we will assist you in applying your coverage with several cleaning options or repair if necessary. Bonded, faux and fabric leather products are covered under the 1st year manufacturer’s warranty for cracking and peeling. All as-is furniture purchases carry the same warranty as new merchandise with the exception of existing defects and/or damage on the item (such as scratches, dents, or missing pieces), which will be noted on your invoice at the time of purchase. Extended warranties can also be purchased for as-is items, but will exclude coverage of existing defects. The Brick will only cover up to the purchase price of the item, not its original value. You can get this incredible furniture coverage even when shopping online. 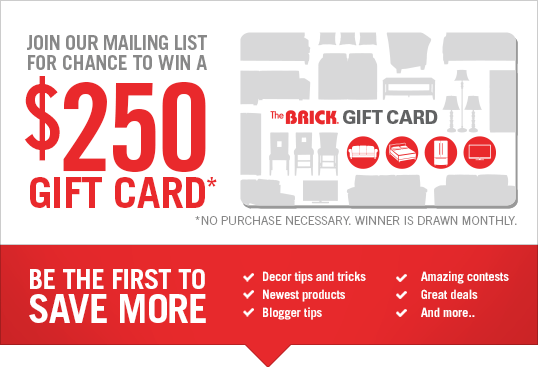 Look for the option to add The Brick’s 5 Year Furniture Protection Plan during the checkout process. Please Note: When purchasing a furniture protection plan online, the plan will cover all furniture products in your order. Look for “Add a Warranty” when you checkout to include an extended warranty. *Single-incident repair means a single incident of the above coverage. Should you need to make a claim, you must do so at the time the incident occurs. Otherwise coverage may not apply. With The Brick’s 5 Year Furniture Protection Plan, you receive long term coverage at an affordable price. You may make several single incident claims throughout the 5 years. Please review the complete terms and conditions of coverage.